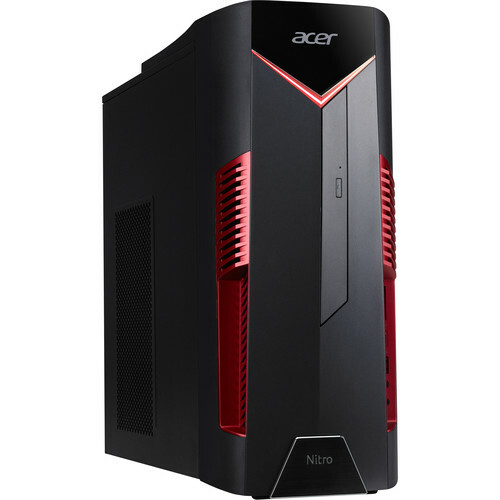 Play your favorite PC games in style with the Acer Nitro 50 Gaming Desktop Computer. The armor-shaped design features red accents and red LED lights. Visuals are handled by a dedicated NVIDIA GeForce GTX 1060 GPU with 6GB of GDDR5 VRAM. You can output to an external display via the DisplayPort, the HDMI port, or the DVI port. The system is powered by 8th Gen Coffee Lake 2.8 GHz Intel Core i5-8400 six-core processor. It also has 12GB of 2666 MHz DDR4 RAM, a 256GB SSD, a SuperMulti DVD burner, a SD media card reader, Creative Sound BlasterX 360, 10/100/1000 Mb/s Gigabit Ethernet, dual-band 802.11ac Wi-Fi which can deliver up to 1.37 Gb/s throughput when using 160 MHz channels, Bluetooth 5.0, USB 3.1 Gen 2 Type-C, USB 3.1 Gen 2 Type-A, USB 3.1 Gen 1 Type-A, and USB 2.0. Windows 10 Home is the installed operating system. A USB keyboard and mouse is included so you can start gaming as soon as you set up your computer. All you need is a monitor (sold separately).